I love taking personality tests to help me get to know myself and other people better. There are many quizzes related to the Multiple Intelligence theory (I added some on this Pinterest board) and I think it's interesting that no matter the quiz, I always have the highest scores in the same three areas- Visual, Intrapersonal, and Linguistic Intelligences. 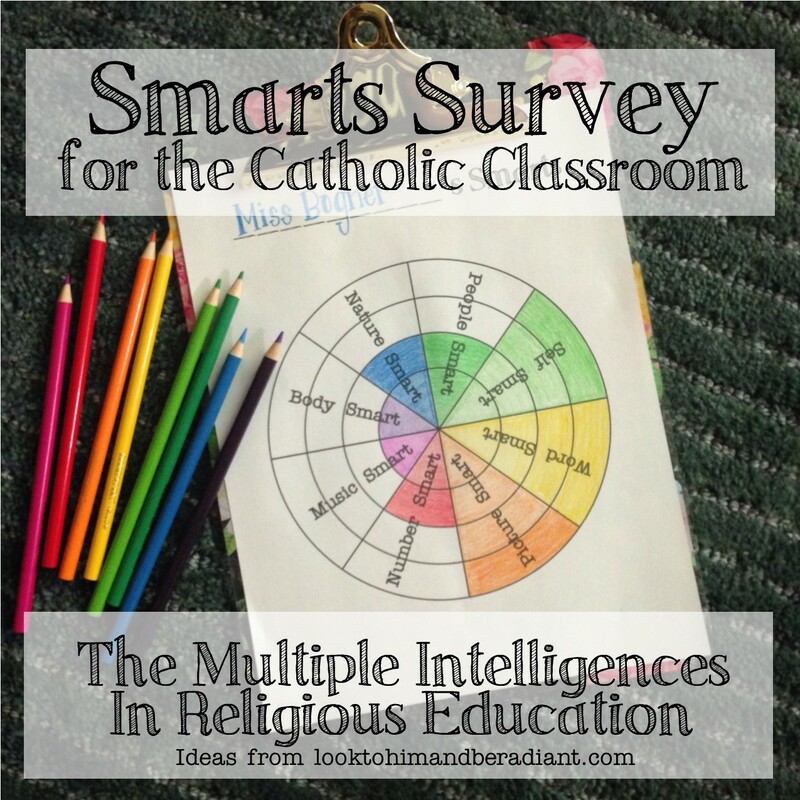 Using a survey like this with students can be empowering for them and insightful for teachers. 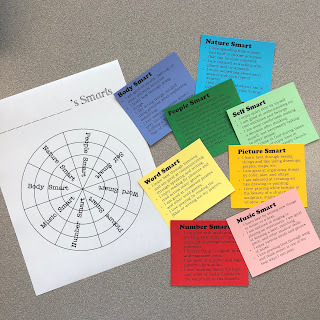 As I have been writing and collecting ideas for this Multiple Intelligences series, I decided that it would be useful to have a quick quiz to use with students to help them see how they are smart. This activity could be used as a tool for students to gain confidence in their talents and use those talents well. It can also help us as teachers make the most of our students' strengths and ensure we are giving them opportunities to shine. -As designed, I think it would be most effective with 4th graders and up. You do have the opportunity to download and edit to make it more effectively fit your audience. Just make sure to keep four total statements for each smart. -Start the activity with an explanation that everyone is smart in their own way. Talk about how God blesses each person He creates with unique and wonderful strengths. There are no wrong answers on this survey or a certain number of spaces to color in, just a chance to get to know yourself a little better. -Post the slide for the first intelligence, have the students pick up a crayon that matches the color of the slide, and read the statements. 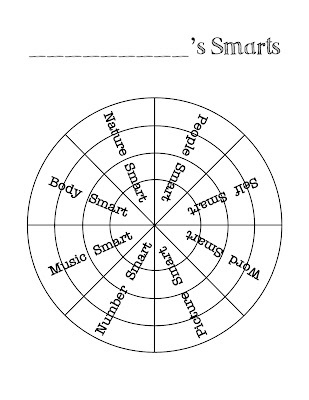 Show the kids how to color in one space on the radial graph starting from the center for each statement that matches their strengths. If all four statements are true, color in all four pieces of that slice of the chart. -Continue on with each intelligence until the chart is filled out. Lead a discussion about strengths and talents, and use the 1 Corinthians verse posted on the last slide to remind the kids that God has made each member of His Church strong in different ways so that we can all work together. -As a powerpoint, the fonts and formatting might not match my original presentation, but you can either download it or make a copy in Google Drive to edit. You can change the fonts or other formatting, or even change the statements on each slide to better fit your group of students. -As a pdf, the formatting will be correct but you won't be able to edit anything. You can still use this for a presentation with your group by viewing it full screen one page at a time. ***Update- If you'd rather do this activity using task cards (how I'm going to opt to do it with a larger group of students) click here to print the survey items six per page. Print on colored cardstock, cut, and you've got sets that students can work through at their own pace! Katie I so enjoy all of your posts and look forward to getting an email that you've added something new! 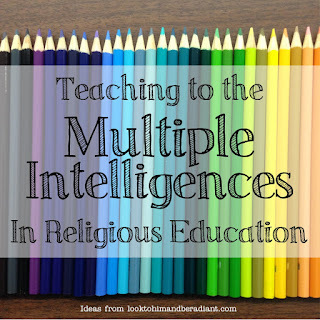 I too use this topic of multiple intelligences to start the school year. 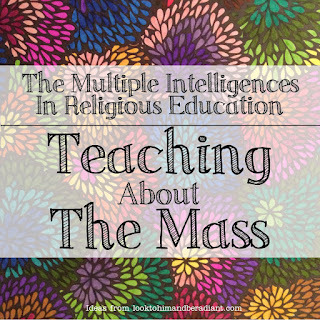 I teach both Middle School Religion and Science in a small Catholic PreK-8 school south of Boston. I like your graphing handout... I usually have students do a bar graph which connects to a graphing review for Science class. We're all kinds of SMART! So glad you are enjoying the series and it will be useful in your classroom! Hope your back to school prep is going well! This is absolutely perfect! I was searching for something on this order, but most surveys were too adult oriented. Combining the graphic organizer with the powerpoint questions makes this survey so kid friendly... then add our faith dimension... LOVE!!! I'm so glad that you liked it and it worked well for your kids! I just did this with my students yesterday, and they seemed to really like it! Prayers for the beginning of your school year! 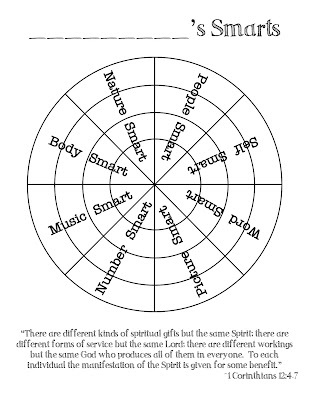 Using this for St. Phils 5th grade faith formation. Your blog is a treasure trove for us. Thank you!